They built ships in Sodus, on the south shore of this lake, of course. There are no records of vessels built there for the War of 1812, but the port was too commodious and the timber too plentiful on its shores for it not to become an important building center in the great experience of lake commerce under sail when the war drums beat no longer. In the last British invasion around which we have been rambling – the Freeman Cup gathering of yachts last month – the compiler of Schooner Days was fortunate in finding Mr. Claude P. Doville, grandson of the greatest ship-builder of Sodus Point. It was the lady with the poser about why there were no monuments to country doctors, who directed us to Mr. Doville as the best-informed man on Sodus history. She was right. Not only that, but Mr. Doville had an original photograph of a three-master on the ways of his grandfather’s shipyard in 1857; and with true Sodus hospitality he lent it to this utter stranger for reproduction. Needless to say it has been returned in perfect order by registered post. The old grass-grown shipyard site on the bay shore has been preserved intact among the thronging summer cottages of Sand Point, but it is years since the village band turned out for the last launching and farmers drove in from miles around to see the big splash. Mr. Doville maintains the family nautical tradition with a well-patronized boat livery. The writer’s guess is that he family name was originally a Huguenot Deauville, or D’Eauville. This would mean “from the town by the water,” would it not? If so, quite appropriate. Eighty years ago, as Thomas’ Register shows, it was spelled Doviel. 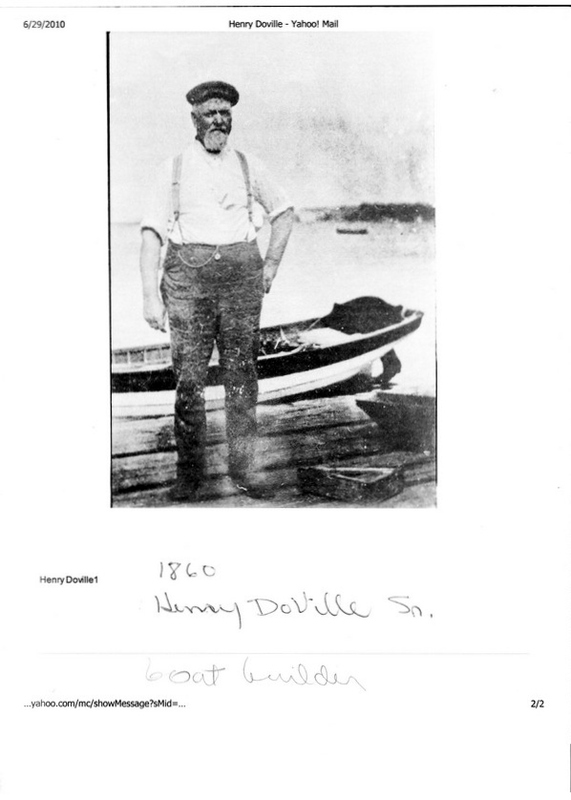 That is the way Henry Doviel, the builder of many Sodus vessels, and Mr. Doville’s grandfather is recorded. Two-master GAZELLE, OF 132 tons, a smart clipper-bowed schooner built at Sodus for B. Eveleigh, of Sacket’s Harbor in 1847. She was well known in Toronto 60 years ago. The late Capt. Joseph Williams praised her beauty, and recalled the deer’s antlers she used to carry at the truck of her foretopmast as a decoration. She is in the old Port Whitby Harbor books of 1855. Two master WAYNE of 80 tons, named for the nearby county, built in 1848 and sold to H. Schroeder, et al, Milwaukee, by 1864. Three master BEN FRANKLIN 172 tons, built by D. McNett for himself and David Hunter, of Sodus, in 1857. The photograph of her before launching, a faded print of the old silver plate process, sows that she was painted white from rail to waterline. She was a small vessel for three masts, but the dead-eyes and chainplates for the mizzen are clearly shown, although the spars are not yet have been stepped. The old-fashioned steam-box in which her oak planks were softened for bending to the shape of her bluff bows shows in the foreground of the picture. She was owned by David Hunter in 1864, but McNett, a South Shore owner and builder of sailing vessels, is also mentioned. One-master GREY EAGLE, 87 tons, built for R.F.Green and Sons, Sodus. This was a large sloop, a rare commercial rig on the lakes, where schooners always outnumbered them twenty to one. She was rebuilt on the bottom of the schooner R.F. Wilson, and was another patron of Port Whitby in the early days, loading spars and squared timber thee in 1855. She carried nearly 5,000 bushels of barley. This is a year before she appears in the Thomas register, but she must have been afloat to be able to pay harbor tolls. Two-master H. GREELEY – “Go west, young man, go west?” – built for John Long, at Sodus, in 1856. She measured 85 tons. Henry Doville also built the sloop GLEN CUYLER, of 40 tons, for J. Todd and Co. of Pultneyville, in 1859. She, too, was trading out of Port Whitby in the great days of the barley trade, in 1862. Possibly she became a schooner and lived longer, for the sloop rig was little in favor with lake sailors. An item in the Wisconsin Door County Advocate, Sept. 19th, 1910, mentions that “the schooner Glen Cuyler, Capt. D.H. Lahey, was in port this week (at Sturgeon Bay) with1,200 bushels Michigan peaches, and went to Egg Harbor to load wood for Two Rivers.” That is the short of lake trading about which a simple pleasing fragrance clings. We used to have little fruit traders here on Lake Ontario, in Prince Edward and Niagara and Grimsby. The Glen Cuyler was built in Pultneyville, next door neighbor to Sodus. Another schooner Henry Doville built was the JAMES CATCHPOLE, launching date and other particulars unknown at this time. She was named after a prominent Sodus citizen. He also rebuilt the old schooner SYLPH completely, and she was renamed the WANNETEE. And he rebuilt the schooner WM. HUNTER. There were several vessels named WANDERER on the Great Lakes, Oakville being the building place of one and Owen Sound the hailing port of another. Henry Doville built another WANDERER in Sodus in 1861. She was a two-master of 84 tons and was owned by F. Felton, Vermilion, Ohio, in 1864. This WANDERER, or some other American bottom of that name, was in commission in 1900 in Sturgeon Bay, Wisconsin, in the fruit trade, carrying baskets of peaches to Menominee. Capt. Dan Seavey was her master. Similar in name and like roving propensities, but smaller in tonnage was the GIPSY of Sodus, 33 tons, built in 1859 on the bottom of the schooner Isaac Walton, by Henry Doviel for Scott and Co. She should have been a fisherman from her origin, but she was in the general carrying trade of the time for small vessels on the lakes – cordwood, lumber, tanbark and grain. There is a record of a schooner Gypsy or Gipsy, being wrecked at North Bay in Lake Michigan in 1883. If this was the little Sodus schooner she had traveled far.